Any resident of Dallas will tell you their hometown is BIG!! It is no exaggeration. 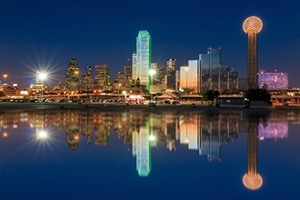 Dallas happens to be one of the largest cities in the United States and it has a major concentration of corporate headquarters, including AT&T, Southwest Airlines, Texas Instruments, and Trinity Industries among other major employers. Dallas is noted for being a center of the oil industry. Oil wells can be seen from the metropolitan area, and adds to the image and character of Big D. Those who work in Dallas are accustomed to having good benefit programs. A group legal plan is something that many of these hard-working people would like to see. It helps them with day-to-day emergencies. Deal making is part of the character of Dallas, and people enter into contracts and agreements for all kinds of things. Pre-paid legal services that include interpretation of the contracts helps in providing misunderstandings becoming major problems. When trouble does arise people are ordinarily going to small claims court for settlement. Here is where a group legal plan that offers help in preparing evidence proves its real worth. People are well aware of boom cycles in both the petroleum industry and real estate. Financial wellness can sometimes be placed in danger as the economy can go from high to low rather quickly. Credit card debt can get out of hand and financial wellness placed in jeopardy. Having the services of a counselor can be extremely beneficial. The Dallas metropolitan area has a number of colleges and universities, including Southern Methodist University and Texas Christian University. Many graduates prefer to work in the Dallas area and they need help with their college loan management. A financial wellness plan, developed by a professional, can help these new graduates set up payment plans and monitor their loan obligations. Dallas has a reputation for being a family oriented city. A group legal plan that offers pre-paid legal services such as drafting a will helps maintain the financial well-being and security of any family. Countrywide Pre-Paid Legal Services offers benefits that can help Dallas employees. We offer both a group legal plan and the financial wellness plan for an employer to look at. What is important to remember is that both lawyers and financial counselors are located within the metropolitan area. Nobody has to travel a distance to meet with either. The lawyers include in the services an unlimited number of telephone calls on a given situation. Financial wellness counselors are more than willing to help any plan member develop a budget. We expect any professional who works with us to have excellent personal skills. It doesn't matter if it is a recent college graduate looking for help, or an executive trying to figure out a contract, the Countrywide staff is there to assist. We do not lecture plan members; we help them. Employers want to help their hard-working employees, but Dallas employers also want good return on the investment. They only want what the employees need and have no interest in frills. Countrywide respects that. We permit clients to choose whatever option they wish to have in the pre-paid legal services benefit or a financial wellness plan. This allows organizations to tailor the benefit to demographics and the real needs of employees. This helps guarantee that the benefits are actually used by employees. Dallas is the big, throbbing heart of Texas. Its people are industrious and some of the best employees in the world. Countrywide wants to help organizations in Dallas provide the kind of benefits employees will greatly appreciate. We have a number of benefit options that decision-makers can look at, and we welcome the chance to explain them. Please feel free to contact us at your earliest convenience.